I just looked back at my 2017 goals and it's amusing that my top goal was to increase our Molly Maids cleaning schedule to twice per month. Days after I wrote that post, Brian changed some things in our budget and we ended up cutting out Molly Maids altogether. 2017 became the Year of Cleaning. It was the Year of the Dirty House. 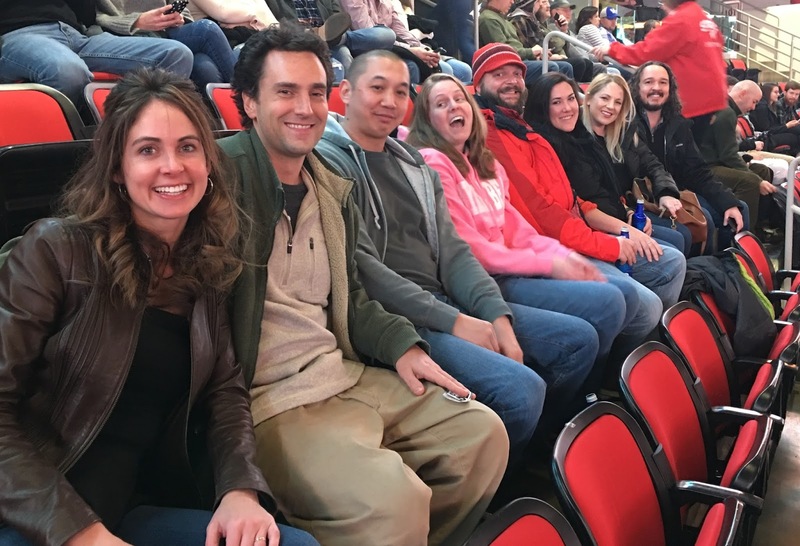 We went to the Avett Brothers' concert on New Years Eve, so that was a wonderful way to ring in 2018! One of my biggest complaints about our house is the lack of sunlight. Unfortunately a garden is not a possibility on our wooded lot. Instead of continuing to complain, I had to get creative in order to achieve my garden dreams. There's a church that's connected to our neighborhood a few streets over and I remembered seeing a huge garden there a few years back. I reached out to the church last Spring and discovered it's a community garden and that each gardener must donate half of their harvest to the food pantry in Wake County. I told them to notify me if a plot ever became available, and sure enough, on January 2nd I got approved for a 5x10 plot! Of course I have zero gardening knowledge, but I plan to fake it 'til I make it. I had to sign a contract committing to two 8-hour work days in the garden this year and one harvesting day per month during the growing season. I was a little hesitant about this, but you know what I always say: Life begins where your comfort zone ends. So, here's to gardening in 2018! I'm a big reader in general, but I want to read more books this year. I started a list -- Uninvited, Year of Yes, Behind Closed Doors, A Simplified Life, Encyclopedia of an Ordinary Life, The Beekeeper's Apprentice. I've already read two books in one week. I hope I don't lose steam. Writing is my preferred creative outlet, so that's probably where I should start. I want to do more cooking and baking, too. The area where I want to get most creative, however, involves coming up with things to do with Cam that are fun for him and me. I hate being bored, and I find that I often get bored playing with a toddler unless I have planned activities. The summer is easy when I can just go to the pool every weekend, but the winter months are more challenging. I don't necessarily want to go places and spend money, so I need more to do around the house or something. Maybe he can help me clean! The "Thirty Somethings" Sunday School class at my church has really taken off since we started in September. We've had new people coming almost every week and it's a really fun group. My mom teaches the class and she does a great job. She is incredibly smart in general; something I've always known, but it's more apparent to me now that she's teaching this class. I've learned so much that I never knew before, even though I've gone to church my whole life. Also, she has a way of making it stick with me. I feel like I could dominate Jeopardy now if the questions involved Bible trivia (well, specifically Exodus and Acts since that's all we've studied so far). I plan to take on a larger role in coordinating and planning activities for the class in the coming year. If you're in the area and looking for a church, I would highly recommend visiting Grey Stone and our Sunday School class! It's always a highlight of my week. Otis has had mange for well over a year now. The vet calls it "Demodex." I suppose that sounds better than mange, but it's the same thing. There's redness and hair loss on his chest. Luckily his case is pretty mild, but it's been nearly impossible to cure. It will involve more bathing, more brushing, and applying special creams that smell terrible. Really it's just a matter of more elbow grease on my part; I just hate dealing with it. As an update to one of my 2017 goals regarding our dogs, they've gotten much easier overall. They still drive me crazy, but Otis particularly has been less stubborn, less aggressive, and overall an easier dog this past year. Also, we've never had a single issue with our dogs around our baby (now toddler), so that's definitely an answer to my prayers!